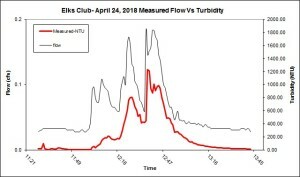 In partnership with El Dorado County and Texas Southern University, the Tahoe Resource Conservation District (Tahoe RCD) is monitoring stormwater runoff from Elk’s Club Drive to quantify the amount of fine sediment that comes from the road itself. Samples are taken of the runoff water and sent to the laboratory for source apportionment analysis. This lab test uses molecular markers to determine what portion of the fine sediment in the runoff comes from native soil (road shoulder erosion), traction abrasives (road sand), and asphalt (the road itself). 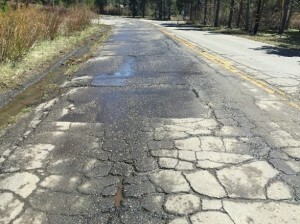 Elks Club road cracked with potholes. Currently, Elk’s Club Drive is in poor condition. It is covered in cracks and potholes. Not only is a degraded road bad for public safety, it is difficult to recover road sand and other material through road sweeping. Road sediment is a large portion of the fine sediment that ends up in Lake Tahoe, reducing its famed clarity. Early results show that up to 30% of this fine sediment includes asphalt (aggregate and binder). El Dorado County will be repaving Elk’s Club Drive this summer. After it is repaved, the Tahoe RCD will continue to monitor the runoff from the road for an additional year. If data shows that repaving roads contributes to improved water quality (less sediment), then improved pavement condition could be recognized as a water quality Best Management Practice (BMP). 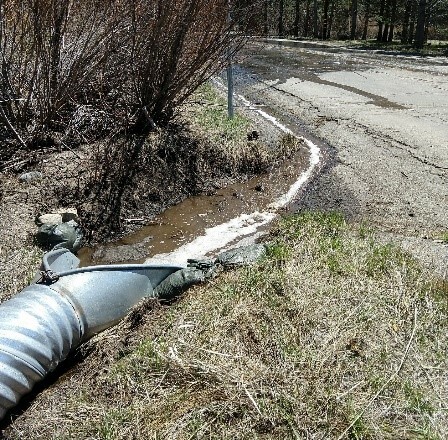 This would not only be identified for garnering credits for the Lake Tahoe TMDL Clarity Crediting Program (https://clarity.laketahoeinfo.org/), but also potentially opening up water quality improvement funds for road maintenance. New roads would be beneficial for public safety, vehicle maintenance costs, aesthetic appeal, driving pleasure, road maintenance and sweeping operations, long term durability, snow removal operations, stormwater quality, and lake clarity. Runoff flowing over road surface. Measuring the runoff flow and volume, and collecting water samples to take back to the laboratory for further analysis. A washoff simulation was conducted in April to analyze runoff under controlled conditions. Over 5,000 gallons of water were released on Elk’s Club Drive and sampled at the terminal location. In a rainstorm, water runs off the road shoulder contributing native soil in runoff. In a snowstorm, there is likely to be high concentrations of road sand on the road and in runoff. The controlled simulation excluded native soil and road sand from the procedure, and focused runoff on the road surface only. Early results show peak turbidities (cloudiness) occurring with peak flows, indicating that sediment is being continually supplied by the road and suggesting that the road itself is eroding. The sediment in the samples will be subjected to the source apportionment analysis to confirm if this hypothesis is correct. Though the data is not yet in, the Tahoe RCD and El Dorado County are hopeful that, in the future, investments in new roads will be viewed as a win-win for the community and the lake. 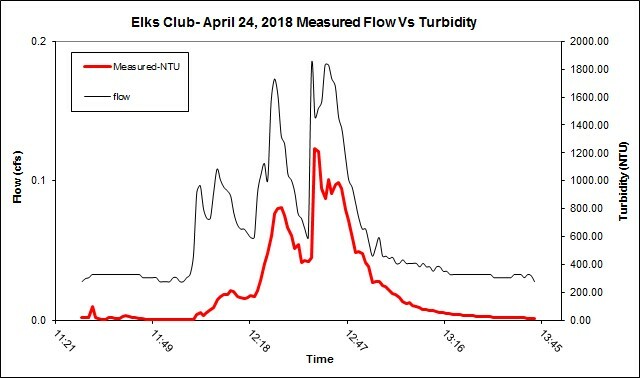 Early results show cloudiness of water (measured in NTU) coincides with the runoff flow peaks. 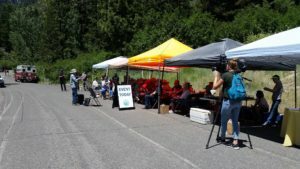 SOUTH LAKE TAHOE, Calif. – The Tahoe Network of Fire Adapted Communities (Tahoe Network) continues to educate and empower Tahoe residents in its second year of operation. The omnipresence of wildfire in California and Nevada has led to a general awareness of wildfire risk, but knowledge of fire behavior is less widespread. Helping people understand embers – how they ignite materials which can lead to home destruction, and how to prevent such events, is a priority for the program. Embers are the greatest catalyst to home ignition during wildfire. They can be lofted to the sky and travel miles from the front of a fire, igniting the plants, debris, and trees they land on. These fuel sources can spread fire to homes if not managed properly. Managing the defensible space on properties out to 100 feet is one way to reduce your risk to embers. Because many properties in Tahoe don’t typically extend 100 feet out from a house, talking to your neighbors about defensible space is imperative. 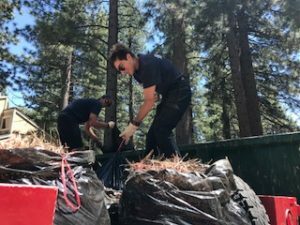 The Tahoe Network seeks to connect neighbors and bring defensible space to the community level, creating neighborhood-wide defensible space and wildfire preparedness. Involved Tahoe residents are a key component to the success of the Tahoe Network. All residents of the Lake Tahoe Basin are encouraged to step up, become leaders, and help prepare their neighborhoods for wildfire. 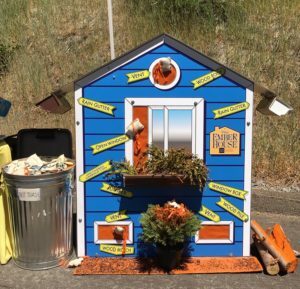 Neighborhood leaders work with community coordinators and fire district personnel, sharing information with neighbors about ember vulnerabilities and defensible space, hosting workshops, and celebrating the work being done. Empowering Tahoe residents to stand with confidence in the face of wildland fire is one of the fundamental outcomes of the program. 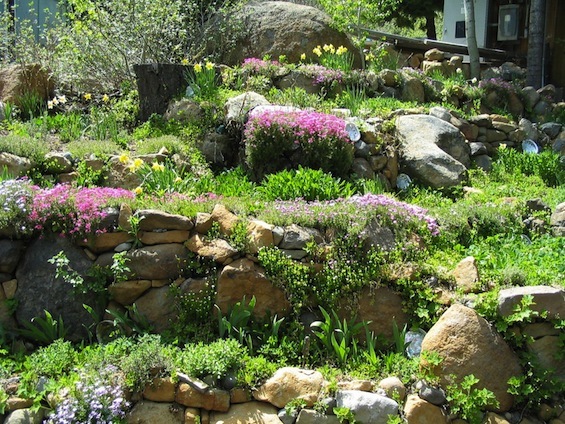 The Tahoe Network has myriad landscaping resources to help you incorporate defensible space into your property, as well as vetted lists of contractors who can do the work. Additionally, local fire protection districts provide free defensible space evaluations and chipping services. Please contact your local fire protection district or our community coordinator for more information. 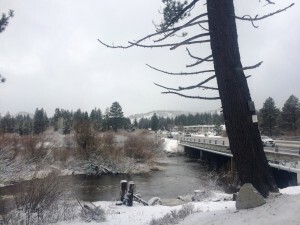 The early storm event that began on January 7 with over 5 inches of rain in some regions of the Lake Tahoe Basin before turning to snow, delivered a massive amount of runoff to the Lake in a short period of time. 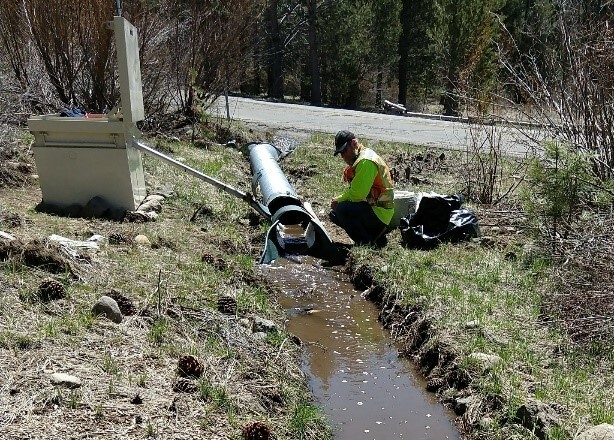 During this storm event the Tahoe RCD Stormwater Monitoring Program measured the highest flows ever recorded at all eight monitoring locations since monitoring began in 2013. Our Tahoe Valley site, located off Tahoe Keys Blvd, measured 1.5 million cubic feet of flow, nearly 90% of the flow that was observed throughout the whole 2016 water year! 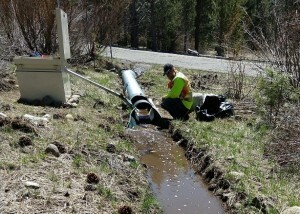 The Tahoe RCD monitors urban stormwater runoff around the Lake Tahoe Basin, providing the science that helps guide stormwater managers in environmental improvement project design and informs them if projects and management strategies have been successful in reducing pollutant loading to Lake Tahoe. Each stormwater sample is analyzed for fine sediment particles (FSP), nitrogen, and phosphorus to estimate nutrient and sediment loading from urban stormwater runoff. This last storm produced over 18 million gallons of runoff just from the sites we monitor alone. All data collected throughout a “water year”, October to September, is compiled into an annual monitoring report, given to stormwater managers and posted on the Tahoe RCD website. With successful implementation of environmental improvement projects that promote infiltration of runoff before it gets discharged to the lake, we have had the pleasure of retiring two of our urban stormwater monitoring sites as we saw significant reductions in pollutant loading from these locations. The Stormwater Monitoring Program is continuously looking for ways to improve stormwater monitoring efforts. New for the 2017 monitoring season, the majority of our sites were outfitted with remote monitoring equipment, allowing us to monitor these sites with smartphones. The new remotely accessible equipment effectively allows our team to view what is happening at our monitoring sites in real time, and determine the best way to manage each individual site during storm events. Our scientific monitoring team is deployed in the most inclement of weather, because good science doesn’t take a break. The severity of this recent storm brought downed trees, dangerous road conditions, and a wealth of water. However, with these remote monitoring systems in place, our team was able to monitor all of our sites without making extensive trips into the field from the safety and comfort of our homes. This new remote technology allows for more reliable data management and easier data reporting. Discover our monitoring locations or view our 2016 Annual Monitoring Report. Follow us on facebook.com/tahoercd to stay up to date on our monitoring activities. The Landscape Conservation Program is seeking input from past participants of the program in order to continue to serve the community with high quality services into the future. If you have received services through the the Landscape Conservation Program in the past, we please ask that you take 5 minutes of your time to fill out the online survey at the link below. Your feedback is highly valued and is integral to the continued development of the program. We thank all that participated this summer for for another great field season.